"We used to look up in the sky and wonder about our place in the stars." It's almost maddening how ambitious Interstellar is. The Dark Knight filmmaker Christopher Nolan's foray into big and bold, sci-fi filmmaking is awe-inspiringly wondrous and audacious yet simultaneously creatively frustrating. It represents all the best and worst tendencies of Nolan as an imaginative, visual, and narrative storyteller including an over reliance on puzzle-like plots and dead wives. His cerebral lens and cold representation of thrilling deep space is admirable in its massive scope and scale executed thoughtfully as it balances theories of relativity with the sentimentalities of parenthood. Interstellar alternates between being a tough and breezy sit through. Its nearly three-hour runtime is both staggering and breathless at moments. What drags the forward momentum is a first act of arduous exposition. Matthew McConaughey busies himself casually discussing the Earth's lack of food and resources, his dead wife, two children, and skills as a pilot/engineer/astronaut during a parent/teacher meeting rather awkwardly. Nolan focuses far too much on explaining and telling us how and why we're seeing what's presented visually instead of resting on the glory of the work and craft in front of us. It's this need to understand every element of the film (including the binding nature of love) that sinks the metaphysical nature of Interstellar. It's not until we leave Earth that the film and its heady ideas really come to life in sync with further developments at home through wormholes, black holes, and fifth dimensions. Based on an original script by brother Jonathan Nolan (initially developed for Steven Spielberg), moulded with Nolan's own concepts, and inspired by the works of theoretical physicist Kip Thorne (a producer on the film), the picture is filled with allusions to Stanley Kubrick and Arthur C. Clarke’s seminal 2001: A Space Odyssey. However, unlike that film, Interstellar aims to balance flawed characters and universal human themes with hard science and metaphysical space exploration. There's so many characters young and old as we follow McConaughey's Cooper and his young children before they grow up to become Jessica Chastain and Casey Affleck, who take over as dual surrogates of their father after he leaves to find a new home for the human race. In a strange twist worthy of Wooderson, McConaughey stays the same age while his family stays the same age. McConaughey's swagger and old school charm lift his tortured reality as a cowboy hero out of time and destined for more adventures than our planet and his family can contain. He makes it work and holds the strings of the many diverging elements of the film together as much as possible. Anne Hathaway does some thankless work anchoring the space travel physics (advancing the work of the father played by Nolan stalwart, Michael Caine) as a suitable companion wracked with her own emotional guilt. It's a testament to the brothers Nolan, their A-list production team (particularly Her cinematographer Hoyte van Hoytema), and the cast that they're able to juggle and pull off as much as they do with a time and galaxy shifting narrative full of late plot twists, hard turns, and exposition about intergalactic, multi-dimensional space travel. The film is most haunting and effective in its locked-off visuals representing the wonder of space and worlds beyond our scope with a silently stirring beauty. By the third act, Interstellar becomes maddeningly frustrating in its remarkable yet problematic exploration of human emotions through metaphysics, aided by Hans Zimmer's understated yet pulsing musical score. 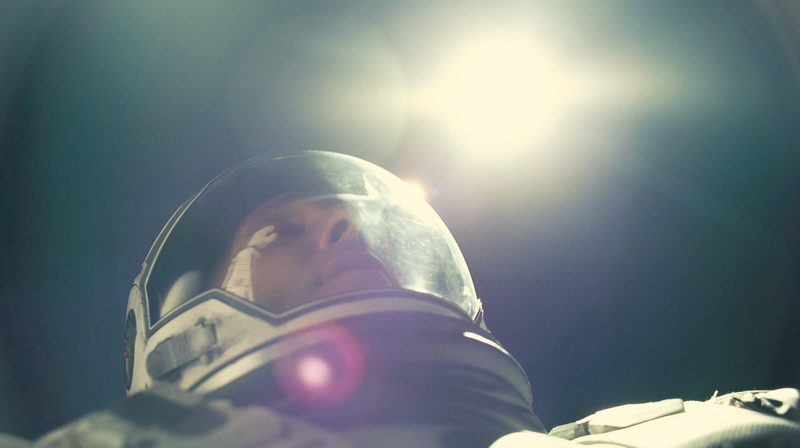 Interstellar is at its best when it focuses on the dazzling visuals of outer space. Its characters and overly ambitious narrative about family drags the its big ideas and scientific theories down to Earth. It's hard not to revel in how Nolan constructs the film with both state of the art visuals and old-fashioned in-camera storytelling to get across deeply thematic ideals about the forces beyond us. There's little doubt it begs to be seen on the biggest screen possible and have every aspect of its mythology picked apart. The way it takes on humanity, other dimensions, love as a binding force, and the nature of the universe is compactly intelligent and thoughtful as it struggles to bridge our past and future together.